“Can Electronic Viewfinders Match Optical Versions?” That was the question that a panel of experts attempted to address at a recent SID-SMPTE joint meeting in New York on March 20, 2018. 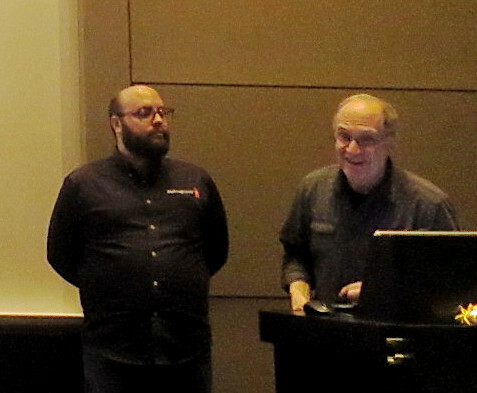 Speakers included David Leitner, an Oscar-nominated producer, director, and Emmy-nominated cinematographer; Jason Druss, a Product Specialist at Blackmagic Design; and Steve Weiss and Jens Bogehegn, product designers from Zacuto, who participated remotely. Leitner has a definite end-user perspective. Since still and motion photography began, optical viewfinders have been a necessity as they are needed to understand exactly what the camera is framing and if the subject is in focus. As was confirmed numerous times during the evening, the primary mission of the viewfinder, whether optical or electronic, is framing and focus. All of the other improvements like resolution, dynamic range, camera settings and more help improve capture efficiency, but are mostly ‘nice to haves’. Leitner showed a number of photographs of optical and electronic viewfinders through the years, but wondered if any of the electronic versions can deliver the quality of the spinning mirror type viewfinder used in a film movie camera first commercialized in 1937. This was a segmented mirror placed at a 45º angle between the lens and the film that spins and provides a through-the-lens view to the eye. Not only does it provide framing and focus information, but it shows the nature of the image coming through the lens. Modern single lens reflex cameras operate in a similar manner but with a stationary mirror that “flips” out of the way for the exposure. Electronic viewfinders are typically microdisplay-based monocular devices that are designed to fit directly against the eye. They compete with direct-view monitors that can be part of the camera body or placed on the camera rig. Both pull the image from the main sensor, but then present it on a display. That means there is a lot of processing in between and there may be limitations in the display itself. There was some discussion about these two types with, perhaps, a generational split. Younger operators seem to be fine with the flip-out type monitor, but older operators like the press-to-the-eye monocular type. According to Leitner, the near-to-eye type viewfinder blocks out the outside world, helps him concentrate as a cinematographer and provides a more theatrical environment to envision the shot. 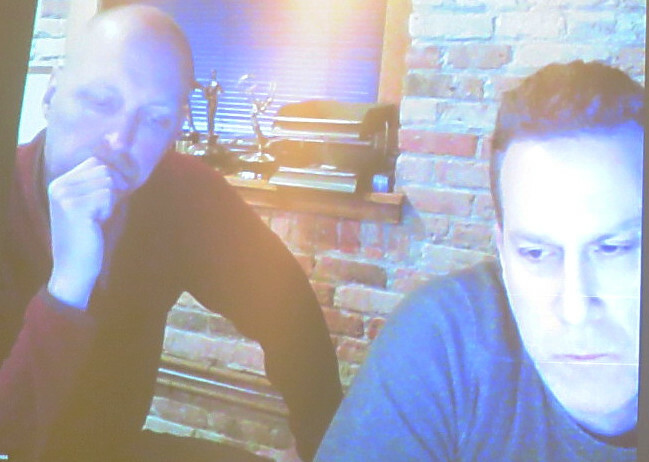 “Flip-out screens are like ADHD displays – too many distractions,” says Leitner. It would appear that all viewfinder or monitor products today support standard dynamic range with 8-bits per color and non-eye limiting resolution. Almost by definition then, they can’t be as good as an optical viewfinder in terms of image quality. But, they do offer advantages. For example, the ability to have a larger canvas allows the sensor image to be displayed in part of the display with camera data or waveform information display above or below it. This allows the camera operator to keep his eye in the viewfinder and see a lot of relevant information, for example. Electronic viewfinders (EVFs) and monitors can also do digital zooms to quickly allow the operator to fine tune the focus with a magnified image (my Sony still camera does this, it’s really helpful when manually focusing – Man. Ed.). This is particularly important with large format sensors which have a very shallow depth of field and very high resolution. Even slight defocusing can become very obvious as image softness. Most viewfinders top out around FHD today, but Zacuto is working on a new version with more than 2Kx2K resolution. They say part of this is to offer more display real estate for data, but to also provide a more detail in the down-sampled image. However, given the small field of views of the near-to-eye EVFs, higher resolution may not be that necessary. Leitner prefers this format to one that overlays data over the image. “Otherwide, it must be easy to dismiss the data so you can see only the image,” he said. As for color, speakers said the OLED displays being used looked really fantastic and that these should be fine for awhile. HDR will be a whole different discussion, however, and one that viewfinder folks don’t seem to be addressing at the moment. 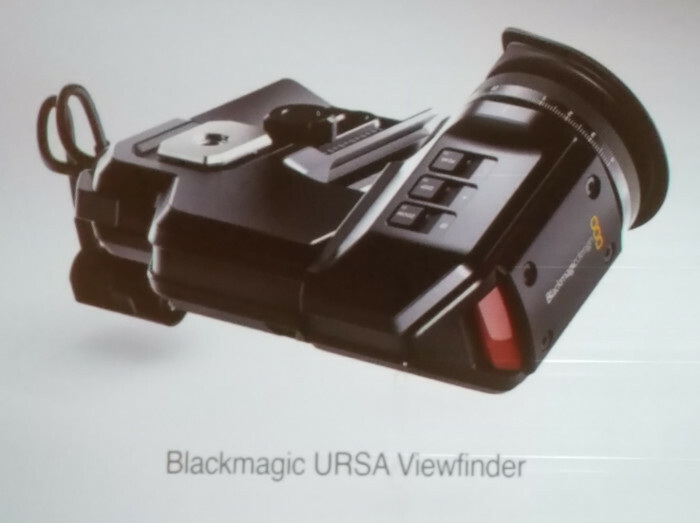 Jason Druss from Black Magic Design described their line of URSA cameras and their Ursa electronic viewfinder. Not only does it fit on their cameras, but other cameras as well using SMPTE standard connectivity. It uses a 0.7” microOLED display with FHD resolution and 8-bits per color. There is also a 4-element diopter adjustment (-4 to +3) so you can use the viewfinder without prescription glasses (assuming you don’t have astigmatism or other issues that might prevent this). Druss also explained that the viewfinder has its own menu system that is separate from the camera and which can be fully customized as the user wants. Another nice feature – the EVF can slide to either side of the camera to suit right- and left-eye-dominant operators. Zacuto also made a good point that they got into the viewfinder business because they had to develop viewfinders because products offered commercially did not suit their needs as end users. They talked to all the camera makers about what EVFs needed to do and none responded, so they developed what they needed. Pretty soon, others wanted them too, so they went into business. 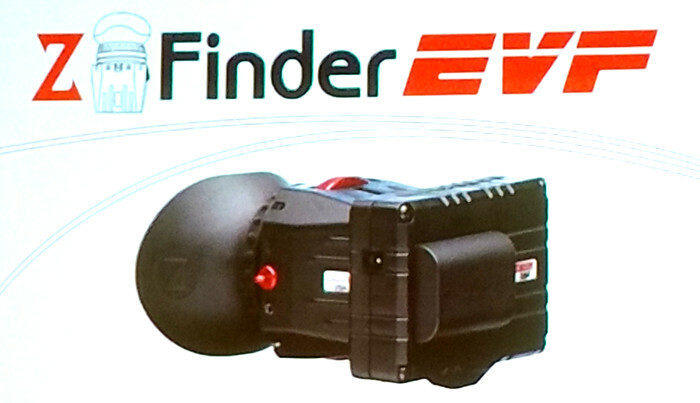 In their talk, Steve Weiss and Jens Bogehegn provided some history on the viewfinders that they have developed over the last 10 years or so starting with their Z-finderPro. This was specifically developed for the Canon 5D Mark II which was a DSLR with a back-of-camera LCD. But there was no optical focus which meant that it had to be focused using a low resolution 3” screen. 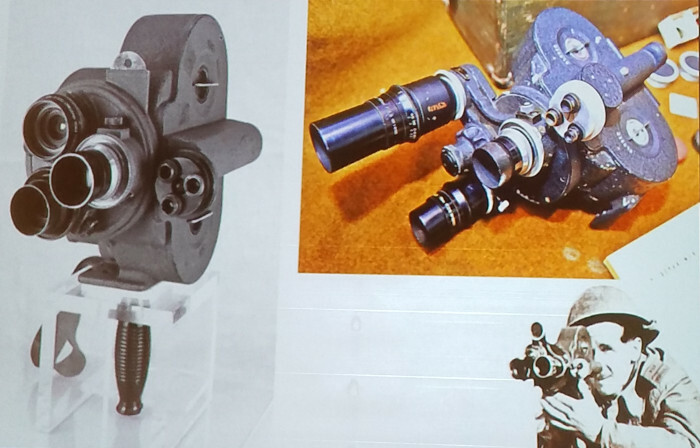 Their solution was a loupe and eyecup placed over the LCD for focusing. This simple concept has seen 15 variations to date including an attachment for flip-out screens as well, and is their best selling viewfinder product. But for shoulder-mounted rigs, the camera and accessories need to be strategically placed for proper balance. This may make access to the flip-out screen inconvenient for the operator. As a result, Zacuto has developed new electronic viewfinders that package the display and the Z-finder concept, but can have more flexibility in their positioning.